During a recent family dinner our 17-year old was discussing her post-high school plans, which led to a walk down memory lane for her parents. While sharing our own ”ancient” college experiences, she was intrigued (rather than horrified) to learn that I had spent the lion’s share of my last year as an undergrad in the morgue gathering specimens at autopsy. Seems old moms can be cool after all! During my senior year, we were running a study (using specimens from posts) to search for a protocol that might lead to a pre-symptomatic diagnosis of pancreatic carcinoma – particularly for tumors located away from the duct, in the body or tail. Even then, finding a way to diagnose pancreatic CA “early” was the Holy Grail – and strongly correlated with a vastly better survival rate. My senior thesis required the collection of dozens and dozens of pancreatic FNAs, which meant hundreds of smears were created and stained. In those long-ago days, this translated into box loads of unwieldy, fragile glass slides needing a permanent place where they could be organized and filed for future retrieval – slides that must be kept carefully segregated from those generated in our clinical lab. In addition, demographic data needed to be “attached” to correlate with microscopic findings. In short, a “study set” was created for each autopsy. In the dark ages of pathology, study sets consisted of a clear plastic “holder” containing a large sleeve to hold patient data on a 3” by 5” card, and four slender sleeves to hold glass slides. Over time, there was inevitable attrition among our study sets. The plastic holders would crack as they aged. Irreplaceable slides would become broken. If not stained or coverslipped properly, slides would dry out or fade over time. Other slides might be borrowed for publication, presentation, teaching, or further study, and never returned to their sleeve. Often we would pull a much-needed study set, only to find a plastic sleeve containing a sole index card with no slides. Digital study sets seem tailor-made to document correlation in a wide array of comparative situations; histo-cyto, colposcopic-histo, and gross-micro. With the press of a button, images are quickly available for comparison – whether for QA, research, publication, teaching, or to build a more complete, robust diagnostic picture. Watching a patient over time is critical when evaluating certain conditions. A good example is when patients undergo solid organ transplant. Over time, repeat serial biopsies are taken to assess for graft rejection and the health of the graft, to see if the primary disease has recurred. Digital slides make it possible to review all the former prior biopsies quickly and efficiently, and in context of the most recent biopsy. Building prognostic study sets goes beyond the basic H&E or Pap stain. 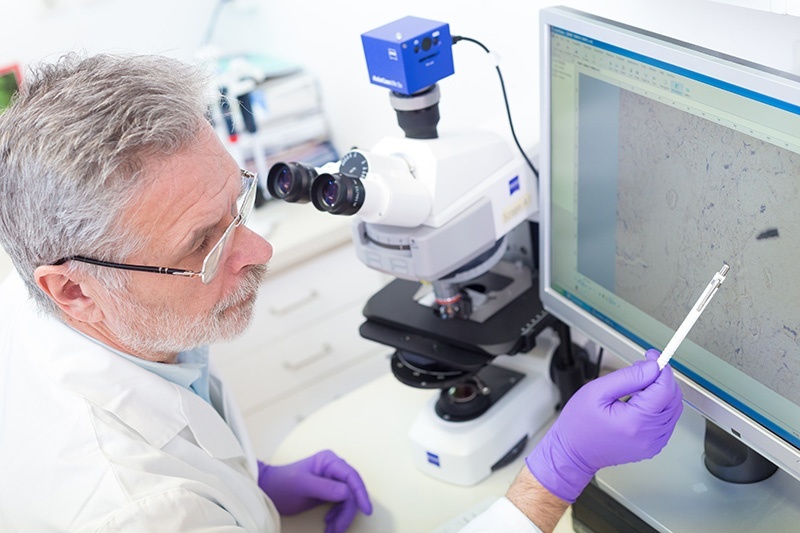 The ability to easily include immuno and molecular stains, photos of gross specimens, and even radiologic images, provide a more comprehensive picture upon which a tailored therapeutic protocol can be built. For a breast cancer patient, this might include several H&Es of the tumor (if the grading is heterogeneous throughout), along with immuno stains for ER, PR, and HER2 – and even a cytokeratin cocktail stain for micromets in an axillary node – all visible on a single screen. Immuno and molecular fluorescent stains can vanish in the blink of an eye. Whether for clinical documentation, publication, or training, building digital study sets of these ephemeral slides provide the shelf life missing in their glass counterparts. When learning to diagnose rare lesions – or common ones for which there are challenging differential diagnosis – the only way to gain proficiency is extensive repetition. The ability to duplicate and share digital study sets removes any barrier to access, easily encouraging repeated exposure. Recently, I uncovered a dusty archive box with the intent of going through the contents in preparation for disposal. It had been buried in the back of my office storage closet for decades, so I was fairly certain nothing precious was inside, but what a sight awaited me. It was filled to the brim with 35mm slides still loaded in their carousels, and old glass-based study sets stored in plastic sleeves. Not quite buggy whips, but antiques nonetheless. Using today’s digital slides, the entire box would fit into one small corner of a reproducible, pocket-size, multi terabyte drive, with room left over for plenty more!